8/31 Cup of Coffee: Pawtucket split a doubleheader with Scranton/WB on Sunday. The PawSox got off to a 5-0 lead in the first contest and cruised to a 5-3 win. Randor Bierd (2-1) started and went 5.1 innings to earn the victory. He gave up 2 runs on 5 hits and struck out 2. Fernando Cabrera earned his 21st save pitching the 9th inning, giving up a run on 2 hits and a walk. Mark Wagner went 2 for 3 with an RBI. Angel Chavez was 2 for 3 and scored 2 runs. The Yankees came back to win the nightcap, 6-1. Scranton scored 5 times in the bottom of the 6th to put the game away. Charlie Zink (5-15) threw 4.1 frames allowing a run on 4 hits and 4 walks. Hunter Jones went an inning, giving up 3 runs. Pawtucket's offense managed just 4 hits in the contest. Portland dropped both games of a doubleheader to New Hampshire. In game one, Daisuke Matsuzaka started and gave up 5 runs in the first inning as the Sea Dogs went on to lose, 5-3. He managed a clean, 1-2-3 second inning before he was removed from the game. He ended up throwing 58 pitches. Chris Province threw 4 scoreless, 2-hit innings. Juan Apodaca went 1 for 2 with a home run and 2 RBI. In game two, New Hampshire downed Portland, 4-2. Felix Doubront (8-6) threw 5 innings, giving up all 4 runs on 5 hits and a walk. He struck out 3. Ryan Kalish went 2 for 4. Ryan Khoury went 2 for 3 with 2 RBI. Salem won its third straight one-run game, downing Wilmington, 3-2. The win, coupled with Kinston's loss, moved the Red Sox into a 0.5-game lead for the final playoff spot in the Southern Division. Dave McKae pitched 6 strong, scoreless innings, allowing just 2 hits. He faced just 19 hitters over the 6 innings and struck out 7 of them. Jon Hee homered in the 6th inning to give the Red Sox a 1-0 lead but they trailed 2-1 going into the bottom of the 8th. Ryan Dent singled, stole second and scored on a 2-out single by Anthony Rizzo, who took second on the throw home. He then stole third and scored what proved to be the winning run on a wild pitch. Jason Blackey (1-0) earned the win, pitching the final 2 innings. He allowed a run on 3 hits and a walk. He fanned 2. Lexington edged Greenville, 4-3, in a 12 inning marathon. Felix Ventura (2-7) was charged with the loss, giving up a walk with two out in the 12th. After the walk, he was replaced by Will Latimer, who allowed a single, a wild pitch and another single to end the game. Fabian Williamson started and went 5 innings, allowing 1 run on 3 hits and 3 walks. He struck out 5. The Drive outhit the Legends 12-9 in the contest. Pete Hissey went 4 for 6 with a run scored and an RBI. Ty Weeden went 3 for 5 with a triple and a run scored. Ronald Bermudez singled home Drew Hedman in the bottom of the 8th with what proved to be the winning run in Lowell's 3-1 win over Brooklyn. The Spinners' magic number to clinch the Stedler Division now stands at 3. Pedro Perez started and gave up 1 run over 4 innings on 3 hits and 5 walks. Cesar Cabral (1-6) pitched 4 scoreless, 3-hit innings of middle relief to pick up the win. He allowed 1 walk while striking out 7. Jordan Flasher pitched the 9th to earn the save, getting out of a bases-loaded, 1-out jam. Derrik Gibson went 3 for 4 with a RBI. He also stole 2 bases, giving him a league-leading 27 for the season. He is just 1 short of the all-time Spinner record for stolen bases in a season. Hedman and Bermudez each had 2 hits in the game. The Gulf Coast Red Sox saw their game canceled yet again. The team's final game of the season will be played Monday, weather-permitting of course. Player of the Night: Dave McKae, who threw 6 scoreless innings, facing just 19 hitters and allowing just 2 hits in earning a no-decision for Salem. Apparently the second major league stint for Marcus McBeth in 2009 will be as uneventful as the first. With Tim Wakefield scratched from his scheduled start against Toronto this afternoon with a sore back, rehabbing starter Paul Byrd has been summoned from Triple-A Pawtucket to take his place in the rotation. To make room for Byrd, the aforementioned McBeth has been optioned to Pawtucket. McBeth had been recalled yesterday when Junichi Tazawa was optioned to the GCL Red Sox, but did not appear in last night's game. This will mark the second time on the season that McBeth has been called up, only to be sent back down the following day. For Byrd, who went 0-2 with a 4.00 ERA in 4 rehab starts for the GCL and Pawtucket Red Sox, this will be his first major league start of 2009. After being acquired last August in exchange for outfielder Mickey Hall, Byrd went 4-2 with a 4.78 ERA in 8 starts down the stretch for Boston. A veteran of 13 major league seasons in which he has played for 7 different organizations, Byrd owns a career record of 108-93 with a 4.38 ERA in 338 games, including 250 starts. 8/30 Cup of Coffee: Pawtucket managed after a couple of hours of a rain delay to play 1 of their 2 scheduled games on Saturday. In that contest, they fell 3-0 to Scranton. Billy Traber (7-7) took the loss going 5 innings giving up all 3 runs. Dustin Richardson pitched 2 perfect innings of relief recording 3 strikeouts. The PawSox managed just 5 hits in the game and they were spread out over 5 frames. Chris Carter went 2 for 4 in the game. New Hampshire edged Portland 7-6. Kris Johnson (0-2) gave up 7 runs on 9 hits and a walk in 4.1 innings. The Sea Dogs fell behind 2-0 after 1 inning but came back to tie the score in the 2nd on homers by Luis Exposito and Jason Place. By the fifth, the Fischer Cats had taken a 7-2 lead. The Sea Dogs rallied with 2 runs in the 7th and 2 more in the 9th on Jorge Jimenez's 2 run homer but the comeback fell just short. Jason Place went 3 for 4 with a homer and 2 runs scored. Luis Exposito and Iggy Suarez each had 2 hits in the game. Salem fought back from a 3-0 deficit to edge Wilmington 4-3. Zach Borowiak scored the winning run in the bottom of the 9th after he walked and advanced to third on a sacrifice and a wild pitch. After 2 intentional walks, Anthony Rizzo drove him home with a single. Kyle Weiland started and went 7 innings giving up 3 runs on 6 hits and 2 walks. He struck out 4. Josh Papelbon (5-2) got the win pitching a scoreless 9th inning. He gave up a hit. Jon Hee led the offense going 3 for 4 with a run scored. Greenville hammered Lexington 9-0. Ryan Lavarnway continued to swing a hot bat hitting his 20th homer of the season. Three Drive pitchers combined for the 5 hit shutout of the Legends. Stolmy Pimentel (10-7) started and threw 5 scoreless innings allowing 2 hits and 4 walks. He fanned 4. Lavarnway went 3 for 4 with 2 runs scored and 4 RBI. Osacar Tejeda and Ty Weeden also had 3 hits each in the game. Both the Lowell Spinners and the Gulf Coast League Red Sox saw their games cancelled due to rain. According to Dan Barbarisi of the Providence Journal, the Red Sox have acquired outfielder Joey Gathright from Baltimore for a player to be named later or cash considerations. Gathright is expected to join Triple-A Pawtucket for the team's game tonight against Scranton/Wilkes-Barre. The speedy left-handed hitter had been hitting .329/.386/.376 with 24 steals in 31 opportunities for the Triple-A Norfolk Tides. He had also appeared in the majors this season for the Chicago Cubs, hitting .214/.267/.214 in 14 at-bats. In parts of 8 minor league seasons, Gathright has accumulated a .317/.396/.367 line with 1 home run, 122 RBI and 221 steals. In a move designed to give the Red Sox more depth in the bullpen, Boston has called up Marcus McBeth from Triple-A Pawtucket and optioned Junichi Tazawa to the GCL Red Sox. With the GCL schedule set to end Monday, Tazawa is expected to be recalled as early as Tuesday. The Japanese rookie had gone 2-3 with a 6.65 ERA in 5 major league appearances, including 4 starts, striking out 12 in 21.2 innings. In 20 minor league starts in 2009 for Portland and Pawtucket, Tazawa has pitched to a 9-7 record with a 2.55 ERA. For McBeth, this will be his second stint in the major leagues this season, having been called up initially on July 31 when Justin Masterson was sent to Cleveland, but sent down again a day later without making an appearance. He had previously seen time in the majors with Cincinnati, going 3-2 with a 5.95 ERA in 23 appearances. Claimed off waivers from the Reds in August, 2008, McBeth has pitched to a 2-2 record with a 2.70 ERA in 42 games out of the Pawtucket bullpen, striking out 62 in 63.1 innings. With roster expansion just three days away, look for Boston to add several players to the active major league roster in the coming days. Some players will be activated off the disabled list, others will be pulled right out of Pawtucket - either on September 1, or shortly after the final PawSox game on September 7. Boston has three players on the disabled list that could make contributions to the big league club in the last month of the season. George Kottaras’ rehab stint in Triple-A ended Friday, and he is expected to be activated on September 1. Daisuke Matsuzaka will make a rehab start in Double-A on Sunday, and he's tentatively slated to return to Boston’s rotation on September 9 or 10. When he's ready to return, Matsuzaka will need to be activated from the 60-day DL, meaning he’ll take one of Boston’s two open 40-man spots. Jed Lowrie is presently rehabbing in Pawtucket, and may or may not return to major league action this year. If he does, it likely wouldn’t be until mid-September at the earliest. Four or five players seem like locks to join Boston’s active roster after rosters expand on September 1. Michael Bowden is eligible to be called up again on September 1 after he was optioned to Pawtucket on August 22. He last pitched for the PawSox on Wednesday. He may get one more start for Pawtucket on Monday or Tuesday, but it’s a safe bet he will be back with the big club on September 1 or shortly thereafter. Boston will also likely want to add Jeff Bailey’s bat to the bench as soon as possible. Similarly, Brian Anderson will add outfield depth and a righty bat off the bench. Paul Byrd is slated to make one more Triple-A start on Saturday, and should be activated soon thereafter, taking Boston’s other open 40-man spot. Last, we expect that Josh Reddick will be called up before September 4 to avoid burning an option year for 2009. Pawtucket’s season ends following an afternoon game in Syracuse on September 7 (Boston plays in Chicago that afternoon). The PawSox are not in the International League playoff hunt, so look for a few more players already on the 40-man roster to join the big club following the conclusion of the PawSox’ season. That list of candidates includes Hunter Jones, Marcus McBeth, Aaron Bates, Dusty Brown, and Mark Wagner. One of Jones or McBeth could get the call to provide some reserves in the Boston bullpen. For the catchers, if past history is any indication, expect that only one of either Brown or Wagner will get the call, and defense will be the determinative factor. Bates could be blocked by the glut of first base options presently available in Boston. Outside possibilities not currently on the 40-man roster include Fernando Cabrera, Javier Lopez, Dustin Richardson, Enrique Gonzalez, Billy Traber, Travis Denker, Chris Woodward, Gil Velazquez, and Angel Chavez. The Sox may have a brief window between September 1 and whenever Matsuzaka is activated to temporarily add one of these players to the 40-man, and Cabrera seems to be a logical candidate. If Lowrie is not able to play for Boston again this year, he could also be moved to the 60-day DL, opening another spot on the 40-man roster. Two players from the 40-man roster that we do not expect to get the call are Felix Doubront and Chris Carter. 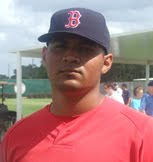 Doubront, 21, is presently pitching for Portland, and likely wouldn’t have any role with the big club this season. Carter has reportedly been sent to the Mets as part of the Billy Wagner deal, but the transaction hit a snag after the Yankees used the waiver process to block the deal from being finalized until the end of the season. The Sox and Mets are apparently looking for creative ways to send Carter to New York for September 1, which would clear another space on Boston’s roster and allow Carter to get some big league service time for the injury-depleted Mets this season. 8/29 Cup of Coffee: On Friday, both Pawtucket and the Gulf Coast Red Sox saw their games wiped out by bad weather. In the Eastern League, New Hampshire downed Portland 6-2. Blake Maxwell (5-8) took the loss giving up 6 runs on 7 hits and 2 walks. He struck out 2. Richie Lentz pitched 2 scoreless, hitless innings. Derrick Loop threw a 1-2-3 9th. Daniel Nava scored both Sea Dog runs. He scored in the first on a RBI single by Lars Anderson and again in the 8th on a Jorge Jimenez single. Daniel Nava went 1 for 2 in the game with 2 walks. After 21 games in AA, he is hitting .413 and has a OBP of .511. The Salem Red Sox split a doubleheader with Wilmington. The Red Sox lost the first game 3-0. Wilmington scored 3 runs in the 4th inning on 2 doubles and 3 singles. Seth Garrison (8-11) threw 7 innings giving up 3 runs on 7 hits. He did not give up a walk and fanned 3. Kyle Fernandes pitched 2 scoreless frames. Che-Hsuan Lin went 2 for 4. Salem came back to take the second contest 1-0. The only run in the game came in the bottom of the 4th when with 1 out, Brad Correll reached second on a 2 base error by Wilmington right fielder Nick Van Stratten. Correll then scored on a single by Jered Stanley. The Blue Rocks staged a mild threat in the 9th inning when Jason Blackey walked a batter and hit another. He then induced the next hitter to hit into a game ending double play. Jose Cappellan (6-3) picked up the win throwing 5 scoreless innings allowing 5 hits and a walk. He fanned 3. Zack Borowiak went 2 for 2 in the game. Ryan Lavarnway's 2 home runs and 4 RBI led Greenville to a 7-5 win over Kannapolis. He now leads the Drive in home runs this season with 19. That is the third most in team history, just 2 behind the record shared by Jon Still and John Otness. Caleb Clay (5-6) turned in a strong performance to earn the win. He allowed just 2 runs on 3 hits over 5 innings. Will Middlebrooks extended his hitting streak to 13 games going 1 for 2. Pete Hissey went 2 for 4 to extend his streak to 10 games. Zach Gentile and Oscar Tejeda each had 2 hits in the game. The Lowell Sun is reporting that Manager Gary DiSarsina said that Westmoreland had messed up his left collarbone. Hudson Valley scored 2 runs in the top of the 8th inning to stage a come from behind 4-3 win over Lowell. Jose Alvarez was in line for his record setting team win when he left the game after going 6 innings allowing just 2 runs on 7 hits. He fanned 7. Michael Bugary (2-1) entered in the 7th and in the inning Ryan Westmoreland made a great catch to preserve the lead. Unfortunately, Westmoreland broke his collarbone running into a wall in the outfield later in the game. He will miss the remainder of hte season and the Fall Instuctional League, but should be good to go for 2010 spring training. In the 8th inning, Hudson Valley scored 3 times on a combination of 2 singles, 2 sacrifice bunts and an error off Bugary and Dennis Neuman to take the lead. Wilfred Pichardo, Drew Hedman and Ken Roque each had 2 hits in the game. 8/28 Cup of Coffee: On Thursday, Pawtucket led 2-1 in the 7th inning when they scored 5 runs to break open a close game and go on to a 7-1 win over Buffalo. Adam Mills (1-1) went 7 innings allowing just 1 run on 5 hits. He struck out 2. Travis Denker led the offense going 3 for 4. His three hits included a double and a triple. He scored 2 runs and drove in 3 more. Portland scored a run in the top of the 9th to edge Binghamton 8-7. With 1 out, Lars Anderson doubled. He was replaced by pinch runner, Matt Sheely. Luis Exposito then doubled to drive in what proved to be the winning run. Daniel Nava went 3 for 5 with a run scored and 4 RBI. His hits were all doubles. He is now hitting .411. Lars Anderson went 3 for 5 with a home run. Jason Place also went 3 for 5. Chad Rhoades (5-2) got the win but not before he was charged with a blown save. He threw 1.1 innings of relief giving up 3 runs on 3 hits. Bryce Cox earned his 11th save pitching a scoreless 9th. Winston-Salem scored 3 times in the top of the 8th inning to stage a come from behind 4-3 win over the Salem Red Sox. Stephen Fife started the game and went 6 strong innings allowing 1 run on 6 hits and a walk. He struck out 5. Armando Zerpa (1-3) was charged with the loss. He gave up a 3 run homer in the 8th which gave the Dash their margin of victory. Che-Hsuan Lin went 2 for 4 and scored a run. Chih-Hsien Chiang had a 2 run double in 4 at bats. Kannapolis downed Greenville 7-3. Brock Huntzinger (8-9) started and went 3.2 frames. He gave up 6 runs on 9 hits and 2 walks. He had 4 strikeouts. Casey Kelly went 3 for 5 with a run scored and a RBI. Pete Hissey went 3 for 5 and scored a run. Alex Hassan went 2 for 4 with a home run. Lowell scored 3 times in the 1st inning and held on for a 3-2 win over Hudson Valley. In the first with 1 out, Derrik Gibson singled and Ryan Westmoreland walked. Michael Almanzar then doubled to drive in both runners. Drew Hedman then hit an infiled single advancing Almanzar to third. He scored on a sacrifice fly by William Holmes. Alex Wilson started the game and pitched 3 scoreless, 1 hit innings. He struck out 3. In 33 innings this year, he has recorded 30 strikeouts and allowed just 9 hits. Cesare Angeloni (1-0) picked up the win throwing 3 scoreless 1 hit innings of relief. Jordan Flasher earned his 1st save pitching a 1-2-3 9th inning. The Spinners now hold a 4.5 game lead in the Stedler Division. The Gulf Coast Red Sox were not scheduled to play yesterday. Player of the Night: Daniel Nava who had 3 doubles driving in 4 runs in the Sea Dog win. He is now hitting .411. According to John Tomase of the Boston Herald, righthanded starter Brad Penny asked for and was granted his release from the Red Sox last night, a move that will make room for the recently acquired Billy Wagner on the 25-man roster. Penny went 7-8 with a 5.61 ERA in 24 starts for Boston, striking out 89, walking 42 and allowing 160 hits in 131.2 innings, after signing a one-year $5 million contract during the off-season. The deal also included up to $3 million in incentives, all of which Penny failed to reach during his time with the Red Sox. A veteran of ten major league seasons with Florida, Los Angeles and Boston, Penny owns a career record of 101-83 with a 4.18 ERA in 269 starts. As Boston's Director of Amateur Scouting, Jason McLeod has been the man in charge of the Red Sox draft board since 2005. In his first two drafts (2005 and 2006), McLeod drafted and signed ten players that have gone on to play in the majors, including Jacoby Ellsbury, Clay Buchholz, and Daniel Bard. The Sox have also drafted a number of intriguing prospects on McLeod's watch, including Casey Kelly, Josh Reddick, Ryan Kalish, Lars Anderson, Michael Bowden, and Ryan Westmoreland. This year, McLeod managed to sign twenty-six of Boston's fifty 2009 draft picks prior to the August 17 signing deadline, and Jim Callis of Baseball America rated the Red Sox 2009 draft haul as the fifth best draft class in the league, stating that Boston "lived up to its reputation as the most aggressive team in the draft." Despite recently being quarantined with the swine flu, McLeod graciously took the time to answer some questions from Mike Andrews and the staff of SoxProspects.com. Mike Andrews: You reportedly brought several players into Fenway for private workouts just before the draft. What is that process like? Is it mostly about getting one last look at a player, talking numbers, and getting physical examinations taken care of? Jason McLeod: The private workouts at Fenway aren’t necessarily geared toward evaluations. You need to be careful not to place too much emphasis on evaluating the Pre-Draft workouts because there are a myriad of factors that could skew a player's performance in these private settings. We like inviting players to Fenway as it gives us an opportunity to spend some one-on-one time with them, try to get to know them a little better as a person, etc. As Scouting Director, the games I attend around the country are usually crowded with other scouts, so often times I will not get to personally meet with players. Bringing them to Fenway allows me to look them in the eye and ask them direct questions about themselves. It's a bonus to see how they react in a major league setting, but we don’t place a whole lot of emphasis on evaluating at the private workouts. MA: Did you find that many of the “signability” players went a lot earlier in the draft this year than they had in previous years? If so, was there a point in the draft that you felt like that you had to significantly adjust your approach to drafting such players? JM: We’ve seen over the past two years players who were considered tough signs being taken in earlier rounds. We do employ certain strategies when lining up our board, but it’s a fine line to walk because you must stay true to your evaluations and the information that our area scouts have obtained in order to correctly identify and select those players in the Draft. MA: It’s been reported that the front office was blown away by Reymond Fuentes in pre-draft workouts. What aspects of his game gave you this impression? Do you see his power and arm strength progressing a lot in the future? JM: Those reports aren’t fully accurate as Reymond also played very well for us during games. He just so happened to have strong workouts as well. Puerto Rico doesn’t have a normal high school baseball schedule like we do here in the States. The majority of games are played on weekends for club teams or during tournaments like the Excellence Games. Because Reymond’s speed has been well-documented, I believe it was assumed we drafted an athlete who will have to learn the finer points of the game. However, we felt all along that we were drafting a baseball player who can already hit and just so happens to already be an 80 runner. I don’t expect Reymond to ever lead a league in home runs, but he does have whip in his bat and will be able to drive the ball into the gaps with home run power as he matures. He has arm strength currently, but will need to work on lengthening out his throwing stroke to get the most out of it, and this is something that will be part of his daily development. MA: How do college relievers Alex Wilson and Kendal Volz compare to some of the college relievers drafted by the Sox in previous years? JM: Both Alex and Kendal spent the majority of their college careers as starters and this is how they will be developed entering their professional careers. Alex is off to a great start in Lowell being on our first year pitching progression and Kendal will not throw until the Instructional League. They are different in style from each other and from others we have drafted in the past. Alex has a bulldog mentality with an attacking style, while Kendal has more of a controlled aggressive approach. MA: There’s obviously a lot to like about third-round pick David Renfroe. Please tell us about his skill set and what factors may be determinative regarding whether he will play shortstop or third base down the line. JM: David is a quality athlete with easy actions on the field. He was the quarterback of a very successful high school program in Mississippi, with his only loss in two seasons coming in the state championship game of his senior season. He had multiple inquiries from D-1 programs to play football, and Houston Nutt wanted him to walk on at Ole Miss. On the baseball diamond, he was a legitimate two-way prospect, with many teams liking him as a right-handed pitcher. We believe he has the skill set to be a premium defender, along with the barrel control and future strength to hit for average and power. He’s nearly 200 pounds, so his lower half mobility will be one of the determining factors of whether he stays at short or moves to third base. He’s never been able to concentrate on one position - or one sport for that matter - so we are looking forward to his future development. MA: Outfielders Jeremy Hazelbaker and Shannon Wilkerson were both selected in the top ten rounds, and both have spent time in Lowell and Greenville this season. What impresses you most about these two players and what areas might they need to work on? JM: Both players are athletic and can play in the middle of the diamond, in centerfield. Shannon put up big numbers at Augusta State, garnering a lot of post-season accolades. We like his strength, athleticism, and aptitude with the ability to hit. Coming from a small college, he plays with a bit of a “something to prove” attitude that we like. Jeremy is just coming into his own as a baseball player. He was moved to the outfield his junior year, so he’s still learning the nuances of the position. He’s another kid who’s athleticism and speed stuck out, and he also happened to have a strong performance last summer which carried into the spring. Both are going to have to make the normal adjustments to the wood bat and fine tune the skill set that will allow their athleticism and natural ability to play up. MA: Many readers are curious about the process of drafting the “tough-to-sign” players like Branden Kline and Luke Bard. Prior to the draft, is it more often the case that these players tell the team: (1) that they’re inclined to sign for the right number; or (2) that they’re planning on heading to school, and you just need to change their minds? JM: Situations vary ... we strive to make the right selections with the information in front of us on Draft day. We understand there are going to be times when that information changes, and unfortunately it will change sometimes after selecting a player. We never begrudge a kid who has an opportunity to go to college and wants that experience. If there is a situation where a player tells us flat out that he’s not going to sign, then we won’t make him a priority in the early rounds. In those instances, we’d be more inclined to take a “flyer” on him somewhere deeper in the Draft. MA: Please tell us a little bit about seventh-round pick Madison Younginer. What does he need to work on to become a Major League starting pitcher? JM: Madison is strong and athletic with plenty of arm strength and the ability to spin a tight curveball. He wasn’t used in a traditional starting role like most high school kids. On one hand, it’s a good thing as we know he has a fresh arm and wasn’t abused by his coaches. On the other, he doesn’t have the innings under his belt the majority of high school kids his age would normally have. He will be on the same development path with the same goals in mind as all of our pitching prospects: fastball command, incorporation of his off-speed pitches for strikes, and consistency in repeating his delivery. MA: It seems as if you took more shots on power potential guys this year in players like Seth Schwindenhammer, Brandon Jacobs, Willie Holmes, and Miles Head. Was this part of a concerted effort to interject some power into the system, or did they just happen to be the best players available at the time? JM: We liked all of their abilities to hit, and it just so happened that they all have power as well. There is a need for power in our system, but we don’t line up our board based solely on that premise. Seth has gotten off to a tough start in the GCL, which isn’t that uncommon for a cold weather high school kid. We felt good with our evaluations of Jacobs and Head during the spring, and Willie Holmes performed well in a JuCo conference in Southern California. MA: After initially drafting Alex Hassan as a pitcher, what inspired the Sox to sign and use him as an outfielder? JM: Alex had performed well in the ACC over the past two years as a position player. The one area he didn’t put up big numbers was in the power department, but Duke is one of the tougher parks to hit home runs in the ACC. We drafted him as a pitcher because we liked how his arm worked, and we felt that he had a chance to work with 3 average pitches. Over the summer, Alex took batting practice at Fenway and played in our Summer Classic game, and he performed well at the plate. He continued swinging a hot bat out on the Cape, and as we watched him more, we determined that he had a chance to make more of an impact as an athletic right handed hitting outfielder. MA: You've had a lot of big draft hits in recent years, but there have also been the inevitable few misses on players that just seem to quickly discover that professional baseball is not their thing. I'm sure there is a process in place to get to know these players and their aspirations before they are drafted. Has that process changed at all over the past five years? Or is this something that's largely left up to the individual scouts? JM: We have a process in place that is constantly being tweaked and updated. Ascertaining the makeup of a player is one of the hardest things - if not the hardest thing - that we do as scouts. As much as it hurts to miss on a player's on-field ability, it hurts even more when you whiff on the makeup. We place a huge amount of responsibility on our area scouts to tell us who the “person” is that we are potentially drafting and whether his makeup will help or hinder him in his development. However, the logistics of the amateur scouting season make it tough to get the necessary time spent with an individual player to feel you have his makeup 100% locked down. Baseball is the only sport that holds its draft during the season. The majority of high-profile players are trying to compete in their seasons and do class work, all while thirty scouts are calling them weekly. I could see where a player would be less than fully forthright with information, just because it is a lot for them to deal with and can be a strain on their time. Saying that, it is still our responsibility to make sure we gather as much information as possible about all potential draftees. MA: Two years ago, we asked you about whether funds that were reportedly “earmarked” for Roger Clemens might be used to sign some additional draftees, and your answer seemingly rejected that proposition outright. In a similar vein, how does Boston’s spending in the international free agent market affect the team's decisions in signing draftees (if at all), particularly in a year like this when a good deal of money was spent on international signees like Jose Iglesias and Jose Vinicio? JM: Our ownership gives us tremendous support to sign the best players possible through all departments in the organization. I can tell you that you won’t find Craig Shipley and I fighting over who we can or can’t sign. MA: We've heard a lot of suggestions on revamping the baseball draft from the likes of Baseball America and ESPN, who have suggested ideas such as implementing a mandatory slotting system, moving the signing deadline to July, allowing teams to maintain drafted high school players' rights through the early years of college, eliminating compensation picks, allowing draft picks to be traded, and instituting a worldwide draft. There's apparently an exploratory committee overseeing these issues, and some of these ideas may or may not make it to the bargaining table when CBA negotiations get underway in the fall of 2011. Are there any ideas that you feel strongly about? If it were up to you, any ideas on how you'd like to fix the draft? JM: Many people have argued that the Draft is not working as intended, and this is going to be a hot button topic when the next CBA comes up after the 2011 season. I’m sure a lot of us involved in the game, particularly with the Amateur Draft, have thoughts and ideas, and I look forward to having those discussions at the appropriate time. 8/27 Cup of Coffee: On Wednesday, Pawtucket downed Buffalo 3-2. Michael Bowden started and pitched 6 strong innings giving up 2 runs on 6 hits and 4 walks. Hunter Jones (4-3) threw 3 scoreless innings of relief to pick up the victory. He allowed just 1 hit. The PawSox scored the winning run in the bottom of the 9th when with 1 out, Angel Chavez doubled and advanced to third on a wild pitch. He then scored on a Josh Reddick sacrifice fly. Dusty Brown went 2 for 4 in the game with a run scored and a RBI. Jed Lowrie left the game after 1 at bat due to discomfort in his repaired wrist. It was termed a precautionary measure. Binghamton edged Portland 3-2. The Sea Dogs took a 2-1 lead in the 6th on a Ryan Kalish double and a Ryan Khoury single. In the bottom of the 7th, however, the Mets regained the lead for good when they responded with a 2 run homer. Ryne Miller started and went 5 innings giving up 1 run on 2 hits and a walk. He struck out 8. Tommy Hottovy (0-2) entered the game in the 6th and was charged with the blown save and the loss. Ryan Kalish went 2 for 4 with 2 doubles and a run scored. Daniel Nava and Ryan Khoury each had 2 hits in the game. Salem scored 3 times in the bottom of the third to overcome a 2-1 deficit and they went on to post a 8-5 win over Winston-Salem. Eammon Portice (7-7) threw 5 innings allowing 2 runs on 3 hits and a walk. He fanned 7. Chih-Hsien Chiang went 3 for 4 with 3 doubles, 2 runs scored and 2 RBI. Zach Borowiak went 3 for 4 in the game. Che-Hsuan Lin had 2 hits in the game and stole his 24th and 25th bases of the season. The win moved Salem to within 1/2 game of the Division lead. Kannapolis got off to a 7-0 lead and coasted to a 8-6 win over Greenville. Jeremy Kehrt (1-1) went 5 innings giving up 7 runs 5 of which were earned on 6 hits and a walk. He struck out 3. The Drive staged a mild threat in the 9th when Oscar Tejeda walked follwed by singles by Ryan Dent and Pete Hissey. Tejeda and Dent scored on an error by the Intimidators third baseman. Alex Hassan led the offense going 2 for 3 with a run scored and 2 RBI. With the score knotted at 2 in the 7th inning, Ronald Bermudez doubled and then scored on a Wilfred Pichardo double to give Lowell the margin of victory in a 3-2 win over Aberdeen. Drake Britton made the start and threw 3 scoreless innings allowing 1 hit and a walk. He struck out 3. Ryan Pressly (6-3) took over and pitched 4 innings giving up 2 runs on 2 hits and 3 walks. He fanned 10. Dennis Neuman pitched a scoreless 9th inning to pick up his 6th save. Ronald Bermudez led the offense going 2 for 4 with 2 runs scored. In the Gulf Coast League, the Red Sox won the completion of the August 21 game downing the Orioles 7-0. Drake Britton's name appeared today as the starter for two different teams. He, however, started the game on the 21st of August and threw 2 scoreless, hitless innings before the game was halted. He was later promoted to Lowell. Pete Ruiz (3-2) took up the reins yesterday and pitched 5 scoreless innings on 5 hits and 2 walks. He fanned 4. Boss Moanaroa led the offense going 3 for 5 with 2 RBI. Both of his RBI cameon a first inning single. In the regularly scheduled game, Oriole pitchers held the Sox offense to just 1 hit and posted a 2-1 win over the Red Sox. The Orioles scored twice in the 5th inning to overcome a 1-0 deficit. The Sox had taken the lead in the third when Tyler Yockey singled and advanced to third on a walk and a wild pitch. He then scored on a ground out to the second baseman. Randy Consuegra (4-4) started and took the loss allowing 2 runs on 4 hits and 2 walks in 4.2 innings. For the second time this month, Enrique Gonzalez has been designated for assignment, this time to make room on the active roster for Tim Wakefield, this according to Chad Finn of Boston.com. Wakefield is scheduled to start tonight against Chicago at Fenway Park. Gonzalez had appeared in 1 game during this latest stint with Boston, firing 2.0 scoreless frames against New York on August 22. In 2 major league appearances in 2009 spanning 3.2 innings total, the 27-year-old righthander has allowed 2 earned runs on 5 hits and 2 walks, striking out 1. He has gone 7-11 with a 5.23 ERA in 23 games for Triple-A Pawtucket, fanning 94 in 127.1 innings. Wakefield, who has gone 11-3 with a 4.31 ERA for Boston so far in 2009, has been on the disabled list since July 21 with back and calf problems. He went 1-1 with a 2.89 ERA in 2 rehab starts at Pawtucket, striking out 7 in 9.1 innings. The Line: Covering his last 53 2/3 innings of work, Weiland has been shutting down opposing lineups with regularity, giving up 46 hits while striking out 54 batters and only allowing 12 earned runs. The right-handed starter has really turned it up in August, going 3-1 thus far while batters have hit just .218 against him, and he hasn’t allowed a home run since May. On August 18 against Lynchburg, he fired 5 1/3 innings scattering 6 hits and striking out 6 to pick up the win. Weiland followed that up with 6 scoreless innings on August 24 against Winston-Salem, fanning a season high 10 batters and allowing 2 hits in Salem’s 7-0 win. He’s currently riding a personal 3-game win streak and has now given up 112 hits in 118 2/3 innings on the season after a tough April. The View: Weiland has made strong adjustments over the course of the season, mainly keeping his stuff down after living too high in the strike zone during the month of April. Featuring a 92-94 MPH sinking fastball with late life, he’s a much more effective pitcher when he is pounding the zone early with his fastball to get ahead of opposing batters, setting up his sharp 9/3 curveball and developing change-up. Weiland’s fastball has darting, downward action and is very tough on batters when he is spotting it on the corners and finishing the pitch down around the knees. The pitch is difficult to lift when he is consistently on top of it and throwing downhill. His secondary offerings are more of a work in progress, but each shows plus potential with added consistency. Weiland sometimes has trouble finishing his curve and keeping consistent arm speed on his change-up, but the pitches have been improving as the season has progressed and his confidence in them has grown. A groundball pitcher, he has the velocity on his fastball to challenge batters from time to time when he is ahead in the count, but cannot consistently live up in the zone. He can also struggle at times to stay ahead of batters, as seen in his rough April. A converted college closer, Weiland has taken well to his new role as a starting pitcher since joining the Red Sox organization in the summer of 2008 and has demonstrated the ability to go deep into games, while consistently holding his fastball velocity. A fierce competitor on the mound, he goes right after batters and has been able to effectively pitch inside early in his professional career, one of his main strengths given the movement on his fastball. Entering the season, there were questions about how he would project as a pitcher down the line. Thus far, he has proven that he can handle his current role as a starting pitcher, and looks to be a factor as a starter when he reaches the Double-A level next season (or potentially beyond with continued sharpening of his secondary repertoire). The Line: Wilson is off to a strong start in his first 30 professional innings, giving up a miniscule 8 hits and 2 earned runs while striking out 27 batters and only issuing 7 walks. Batters have hit .082 against the right-handed pitcher, and he has yet to give up a home run. Wilson dominated Batavia in 3 scoreless innings on August 9, surrendering only 1 hit and fanning 4 batters. Against Oneonta on August 22, he pitched 3 hitless innings while striking out 2. Wilson has been especially tough in August, allowing only 2 hits over 12 innings of work. The View: After coming off a college season filled with mixed results, the second-round draft pick has been dominating the NYPL, which given his age and stuff shouldn’t be overly surprising. Wilson’s two best offerings are a low 90s fastball that has topped out at 94 thus far and an 81-83 MPH slider with plus potential. Moving his fastball in and out to batters, he’s able to command both sides of the plate and elevate it when he needs to push past hitters with a little something extra. He’s primarily been sitting 92-93 with his fastball and has been limited to 40 pitches per outing after a heavy workload at Texas A+M. Prior to having Tommy John surgery in 2008, Wilson’s heater worked more in the mid-90’s and topped out around 97 MPH. His command of the pitch has been above average upon entering the professional ranks, and there is a chance some more velocity will return as he continues to strengthen his arm. An uptick in velocity would greatly enhance the effectiveness of his fastball and move it more into an overpowering category. Wilson’s slider has been a good offering for him, but there is some room for sharpening the pitch, and at times it has looked more like a sweeping slider rather than one that darts hard out of the strike zone. As he advances to higher levels within the system, this will be a pitch that will need some more development to become a true out pitch for him. The Red Sox have Wilson working on a starter’s schedule right now, with the intention of stretching him out and beginning his progression in that role. He has currently been working a change-up into his repertoire and has been starting to get the feel for throwing the pitch. Wilson also features a curveball, but he has thrown it with less frequency in his time at Lowell. Considered a bit of a tweener right now, his ability to develop his change-up will determine his future role. Wilson has looked sharp in his 40-pitch stints, but it won’t be until next season -when he starts to go deeper into games - that a good picture of how he will project will come into focus. After spending the first part of the season with the Salem Red Sox, Lowell’s Jose Alvarez has found his groove pitching regularly for the Spinners and was recently rewarded as an All-Star in the NYPL All-Star Game. The left-handed starter has gone 7-3 with a 1.54 ERA in 12 appearances and recently tied the record for most wins in a season by a Lowell pitcher. Alvarez features an 88-91 MPH fastball with slightly above-average command. His low 70’s straight change-up is his best offering and is extremely deceptive on batters due to his arm action. Alvarez also mixes in a mid 70’s curveball that can show sharp break at times, but can also be a little inconsistent. He’ll need to continue to be fine with his pitches as he moves back up to full-season baseball next season, but also shows some potential to fill out his frame some more and add some velocity in the process…Daniel Nava has been red hot since his promotion to Portland, clubbing 4 home runs in 63 at-bats along with posting an 1.214 OPS. Hampered with an injury that delayed the start to his season, Nava has ramped back into form and picked up where he left off after winning the California League batting title last season with the Lancaster Jethawks…Spinners outfielder Wilfred Pichardo has been locked in at the plate in August and is currently 15 for his last 40 with 12 runs scored, 8 stolen bases, and 10 runs batted in during the stretch. Pichardo has been staying back on the ball much better after jumping out and lunging at pitches in the beginning of the season. He’s shown some nice signs of improvement at the plate as the season has gone along. The fastest player in the Red Sox organization, he uses his wheels to his advantage by slashing at pitches, but has also been driving the ball a little bit more as he has settled in. Defensively, Pichardo gets good jumps on the ball in the outfield and has shown a good arm. Josh Reddick has found the initial transition to Triple-A to be a tough one, as he has started 6 for 46 with only 1 extra-base hit. He’s been rolling over a lot of balls in the early going and hasn’t found his timing at the plate yet. Reddick is still working on his approach at the plate, which made strong strides in Double-A this season, but will need to focus more on driving the ball the other way on pitches running away from him…Lars Anderson’s difficult season has extended into August as he is just 6 for 39 in the month. Anderson has struggled for most of the season with his balance and has not been driving the ball with much consistency for much of the season. He only has 8 extra-base hits in July and August, and hasn’t homered since mid-June…Jeremy Hazelbaker has found the South Atlantic League to be a bit tough and is now hitting .192 in 125 at-bats. The 2009 fourth-round pick has been adjusting to professional pitching and has been challenged with top competition each night after playing his college baseball at Ball State. 8/26 Cup of Coffee: Pawtucket fell 8-5 to Lehigh Valley in 12 innings. The Iron Pigs scored 3 times in the 12th on 3 walks, a hit batter, an error and an infield hit. Jose Vaquedano (4-2) took the loss. He pitched the 11th and 12th innings. The PawSox hit 4 home runs in the game. Jed Lowrie had 2 of them with Aaron Bates and Jeff Bailey having one apiece. Portland downed Binghampton 3-1. Lefthander Felix Doubront (8-5) went 6 innings allowing 1 run on 4 hits and 2 walks. He had 3 strikeouts. The Sea Dogs had 13 hits in the game. With the score tied at 1-1 in the 5th inning, Daniel Nava singled and drove in Yamaico Navarro with what proved to be the winning run. He scored an insurance run in the 8th being driven in by Jorge Jimenez after doubling to lead off the inning. Bryce Cox earned his 10th save of the season pitching a scoreless 9th. Nava went 3 for 5 with a RBI. Salem scored 3 times in the bottom of the 8th inning to overcome a 2-1 deficit and held on to edge Winston-Salem 4-3. Kyle Fernandes (5-3) got the win in relief of starter Dave McKae who had given up 2 runs in 6 innings. Fernandes allowed a run on 3 hits in 2 innings of work. Luis Segovia was the offensive star for Salem going 3 for 4 with 3 RBI. William Vazquez went 2 for 4 with a RBI. Kannapolis scored 2 runs in the top of the 8th to stage a come from behind 4-3 win over Greenville. Kyle Rutter (0-1) made his debut for Greenville and was charged with a blown save and the loss. He gave up 2 runs on 3 hits and 3 walks. Shannon Wilkerson went 2 for 5 and scored a run. The Spinners broke the game open scoring 4 runs in the top of the 9th on way to an 8-2 win over Aberdeen. Yeiper Castillo (5-1) started and earned the win going 5 innings. He allowed 2 runs on 4 hits and 2 walks. He struck out 6. Cesare Cabral earned his 4th save pitching 4 clean innings. He fanned 4. Ryan Westmoreland went 3 for 5 with a run scored and a RBI. He also had 2 stolen bases. In the Gulf Coast League, the Twins edged the Red Sox 5-4. They scored the winning run in the bottom of the 8th when with 2 out, shortstop Jose Garcia's error allowed a runner to reach first. The next hitter drove in the winning run with a double. The Red Sox threatened in the bottom of the 9th when Felix Sanchez walked and stole second with 1 out. Both Carson Blair and Miles Head then struck out to end the threat. Michael Lennox (2-2) took the loss allowing a run on 1 hit. Felix Sanchez went 2 for 4 and scored twice. Carson Blair went 2 for 5 with 2 RBI. Last week's players of the week voting saw one clear winner, Lowell's Wilfred Pichardo for Player of the Week, and one nail-biter as Pawtucket's Adam Mills edged Portland's Andrew Dobies by a single vote for Pitcher of the Week. Pichardo battered the opposition, posting a .450/.542/.600 line in 20 at-bats over 5 games with 3 doubles, 7 RBI, 8 runs and, most notably, 7 stolen bases, while Mills made the most of two starts (Aug. 19 at Gwinnett and Aug. 22 against Lehigh Valley) allowing 2 runs on 9 hits in 13 innings-pitched, striking out 10 while walking only 1. Mills allowed both runs at Gwinnett. In three starts with Pawtucket since being promoted August 9, Mills is 0-1, allowing 7 earned runs on 18 hits over 15 innings pitched, for a 4.20 ERA and .310 opponents average. He is 10-6 with a 4.24 ERA, allowing 59 earned runs on 139 hits in 125.1 innings pitched over 23 starts combined with Portland and Pawtucket. Pichardo is batting .296/.348/.383 with 2 home runs, 10 doubles, 1 triple and has stolen 23 bases in 31 attempts. He also was named New York-Penn League Player of the Week for the same period. Arizona Fall League rosters have been announced, and four Red Sox prospects will be suiting up with the Mesa Solar Sox when play begins on October 13. According to Baseball America, pitchers Dustin Richardson and Chris Province, catcher Luis Exposito, and outfielder Ryan Kalish are all confirmed participants. The Sox will also send two additional pitchers and two infielders that will be announced at a later date. Richardson (pictured) has enjoyed a fine season split between Double-A Portland and Triple-A Pawtucket, going a combined 2-2 with a 2.62 ERA in his first full season as a reliever, striking out 83 in 65.1 innings. Chris Province has had a nice season of his own out of the Portland bullpen, putting up a 2-4 record with a 2.94 ERA in 70.1 innings pitched. Exposito, meanwhile, began the season in High-A Salem and compiled a .271/.329/.424 line with 6 home runs in 76 games before earning a promotion to Portland. He has put up even better numbers since then, pummeling the Eastern League to the tune of .361/.381/.492 in 15 games so far. It's been a similar ride for Ryan Kalish in 2009, as the 21-year-old outfielder hit a robust .304/.434/.504 with 5 home runs in 32 games for Salem before earning his promotion to Double-A. Since then, Kalish has found his home-run stroke, hitting .271/.334/.421 with 10 long balls in 89 games for Portland. The AFL season runs from early October through mid-November, and is generally reserved for highly regarded prospects who the organization is looking to advance in the upcoming season. For more information about the AFL, check the SoxProspects.com Wiki. According to Boston.com's Tony Massarotti, the Red Sox have agreed to send two players to be named later to the New York Mets in exchange for 38-year-old reliever Billy Wagner, who has reportedly agreed to waive his no-trade clause. The hard-throwing lefthander has pitched in just 2 games so far this season for the Mets after returning from Tommy John surgery, striking out 4 and walking 1 in 2.0 hitless innings. In his fifteen-year major league career with Houston, Philadelphia and New York, Wagner has gone 39-37 with 385 saves in 767 appearances, striking out 1070 and walking 271 in 820.0 innings while posting a 2.39 ERA. Boston, which had claimed Wagner off waivers last week, will be responsible for the remainder of Wagner's salary this season, and will hold an $8 million team option to retain his services in 2010 that can be bought out for $1 million. The Red Sox could also decline the option and offer Wagner arbitration, which due to Wagner's Type A status would net the team two draft picks in 2010 should he choose to sign elsewhere. 8/25 Cup of Coffee: Jeff Bailey hit a 1-out sacrifice fly in the bottom of the 9th inning to give Pawtucket a 3-2 win over Lehigh Valley. Jed Lowrie homered in the 6th to tie the score and Mark Wagner had a RBI single in the 6th to give the PawSox a 1-run lead. Hunter Jones then allowed a home run in the top of the 9th to tie the score before Bailey's game-winning RBI in the bottom of the frame. Paul Byrd started and threw 7 strong innings allowing 1 run on 3 hits. He did not walk a hitter and fanned 4. Harrisburg took the lead in the 1st inning and never looked book on their wa y to a 6-4 win over the Sea Dogs. Kris Johnson (0-1) started and gave up 5 runs, 4 of them earned, on 9 hits and 2 walks over 5.2 innings. He struck out 3. Daniel Nava went 3 for 5 and raised his batting average to .379. Luis Exposito continued his hot streak, going 2 for 4. He is now hitting .361. Jason Place went 2 for 3 with a home run and 3 RBI. The Sea Dogs were 2 for 10 with RISP and left 10 runners on base. Salem scored twice in the bottom of the 4th inning when Mike Jones doubled and Brad Correll homered. They added 5 more in the 7th on 3 walks, 3 hits, 2 errors and 2 wild pitches. The final result was a Salem 7-0 win over Winston-Salem. Kyle Weiland pitched 6 scoreless innings, allowing 2 hits and 3 walks. He struck out 10. Armando Zerpa and Robert Coello held the Dash hitless for the final 3 innings. West Virginia jumped out to a 9-0 lead after 3 innings and coasted to a 12-6 win over Greenville. Stolmy Pimentel (9-7) lasted only 2 innings, giving up 8 runs on 7 hits and 2 walks. He had 2 strikeouts. The Drive scored 3 times in the 9th with 2 out to make the result more respectable. Will Middlebrooks went 2 for 4 with a run scored and an RBI. Alex Hassan went 2 for 5 with an RBI. Ryan Dent went 2 for 4 and scored a run. Greenville were 2 for 12 last night with RISP and left 12 runners on base. Aberdeen scored 7 times in the 1st inning and went on to an 11-0 hammering of Lowell. Starter Pedro Perez went 1.1 frames, giving up 9 runs, only 4 of which were earned. The Spinner defense committed 2 errors in the first inning, which accounted for the unearned runs. The offense had 6 hits in the game, with Tom Di Benedetto going 2 for 2. In the Gulf Coast League, the Red Sox shut out the Rays 2-0. Daisuke Matsuzaka made his first rehab start and threw 3 scoreless innings, giving up 1 hit. He did not allow a walk and had 4 strikeouts. Roman Mendez (2-2) pitched 5 scoreless innings to earn the win. With 2 on and 2 out in the 2nd inning, Felix Sanchez drove in a run with a single, and Juan Bonifacio scored on a wild pickoff attempt to provide the margin of victory. Player of the Night: Kyle Weiland, who threw 6 scoreless innings, allowing just 2 hits and striking out 10 batters. 8/24 Cup of Coffee: Highly touted Phillie prospect Joe Suarez notched his 15th win of the year, 3 of which have come at the Triple-A level, as Lehigh Valley downed Pawtucket 4-2. Billy Traber (7-6) started and took the loss, going 4.2 innings and allowing 3 runs on 8 hits. The PawSox managed 6 hits in the game, with Jeff Bailey going 2 for 4. Pawtucket has now lost 38 of its last 49 games. Jorge Jimenez's single in the bottom of the 10th inning gave Portland a 3-2 walkoff win over Harrisburg. Blake Maxwell started and went 5 innings, allowing 2 runs on 5 hits and 4 walks. Tommy Hottovy and Andrew Dobies held the Senators scoreless for the next 3.2 innings. Bryce Cox (1-5) entered the game and held Harrisburg scoreless for the final 1.1 frames and earned the win. Jimenez went 2 for 5 with a RBI and Luis Exposito went 3 for 4 with a home run. In 57 at bats with the Sea Dogs, he is hitting .351. Salem split a doubleheader with Potomac on Sunday. In the first game, Chih-Hsien Chiang hit a three-run homer in the 6th inning to provide the margin of victory in a 3-1 win over the Nationals. Seth Garrison (8-10) started and got the win, going 5 2/3 innings and allowing 1 run on 3 hits. Derrick Loop recorded the final 4 outs to earn his 16th save, which ties him for second-most in the Carolina League. In the second contest, Potomac scored 7 runs in the 2nd inning en route to a 14-2 hammering of the Sox. Salem scored twice in the 7th inning to avoid a shutout. Jose Capellan (5-3) lasted 3 innings, giving up 10 runs on 7 hits and 4 walks. He struck out 3. Jason Blackey also had a rough outing, giving up 4 runs in 2 innings of work. Trailing by a run going into the bottom of the 4th inning, West Virginia scored 3 times and went on to a 4-1 victory over Greenville. Caleb Clay (4-6) started and took the loss, giving up 3 runs on 3 hits in 5 innings of work. He struck out 5. Michael Lee pitched the final 3 frames allowing a run on a hit and 2 walks. Oscar Tejeda went 2 for 4 and Ryan Lavarnway went 1 for 3 with a home run. Lowell scored 4 runs in the top of the first and went on to a 12-2 win over Oneonta. Jose Alvarez (7-3) turned in a strong performance and picked up his 7th win, tying a franchise record for wins in a season. He went 6 innings, allowing 1 run on 2 hits. He did not allow a walk and had 8 strikeouts, lowering his ERA to 1.54. Wilfred Pichardo went 2 for 3 and scored 4 runs. He extended his hitting streak to 9 games. Michael Almanzar went 3 for 5 with 3 RBI. The Spinners now hold a 2-game lead in the Stedler Division. In the Gulf Coast League, the Reds downed the Red Sox 2-1. Manuel Rivera (1-3) took the loss, giving up 2 runs on 7 hits over 5 innings of work. He struck out 4. Kyle Stroup and Dustin Mercadante held the Reds scoreless for the remainder of the game. Jose Garcia went 1 for 3, hitting a home run in the bottom of the 8th inning to bring the Red Sox within 1. The Red Sox had 2 on with 1 out in the bottom of the ninth, but could not complete the comeback. Player of the Night: Jose Alvarez, who picked up his 7th win to tie a Lowell record for victories in a season. 8/23 Cup of Coffee: On Saturday, Lehigh Valley and Pawtucket were scoreless for 10 innings but the Iron Pigs tallied 3 runs in the top of the 11th to down Pawtucket 3-0. The PawSox had an excellent chance to win the game in the bottom of the 10th when they had the bases loaded with 2 out but Jeff Bailey flied to right to end the threat. The Iron Pigs scored 3 times in the top of the 11th on a walk, double, another walk and another double. The PawSox went 1-2-3 in the bottom of the inning. Adam Mills started threw 7 scoreless innings allowing just 3 hits. Marcus McBeth and Hunter Jones held Lehigh scoreless until TJ Large entered the game in the 10th. He managed to record an out in the 11th but was charged with giving up all 3 runs on a hit and 2 walks. Jose Vaquedano got the final 2 outs but gave up 2 hits. The Pawtucket offense managed just 3 hits in the game. Portland dropped both games of their doubleheader with Harrisburg. The Sea Dogs fell 5-4 in the first contest. The Senators scored single runs in the 6th and 7th innings to edge out the Sea Dogs. Chad Povich (4-2) pitched the 7th and gave up the winning run on a hit and 3 walks. Daniel Nava went 2 for 4 with a home run and 2 RBI to lead the Dogs. He raised his batting average to .404. Jon Still tied a team record with his 36th double of the season. The Senators took the 2nd game 3-1. Ryne Lawson (3-11) gave up all 3 runs in 5.2 innings of work. He gave up 6 hits and a walk while recording 4 strikeouts. Ritchie Lentz got the final 4 outs of the game without giving up a run. He allowed a walk and had 2 strikeouts. Jason Place went 2 for 2 with a RBI. The 2 losses see Portland sitting in 4th place in their division. The Salem-Potomac game was postponed. Greenville swept both games of their doubleheader from West Virginia. In the first, the Drive scored 6 runs in the top of the 2nd inning and coasted to a 6-3 win. Brock Huntzinger (8-8) earned the win allowing 2 runs on 5 hits and a walk over 5 innings. Mitch Herold pitched the final 2 innings giving up a run on 2 hits. He fanned 3. Shannon Wilkerson went 3 for 4 with a run scored and 2 RBI. Ryan Dent and Will Middlebrooks each had 2 hits in the contest. The Drive took the 2nd contest 8-6. Chad Povich started the game and lasted 2.2 innings giving up 3 runs on 3 hits and 2 walks. He struck out 4. Leandro Marin (3-2) earned the win going 2.2 frames. He gave up a run on 2 hits and a walk. He had 6 strikeouts. Lance McClain got the final 5 outs in the game but not before allowing 2 runs to score. Shannon Wilkerson went 2 for 4 with a home run and 2 RBI. Spinner hurlers Alex Wilson and Tom Ebert took a no-hitter into the 6th inning on way to a 5-2 win over Oneonta on Saturday. Wilson threw 3 scoreless, hitless innings allowing 2 walks. He lowered his ERA to 0.60. Ebert gave up a pair of runs in the 6th on 3 hits. He fanned 4 over his 3 innings of work. Jordan Flasher (1-0) earned the win throwing 2 scoreless innings. Kyle Rutter pitched 1-2-3 9th to earn his first save as a professional. The win gave the Spinners sole possession of first place with a record of 34-26. Wilfred Pichardo went 2 for 4 with 2 RBI. He also stole his 21 and 22 bases of the season. Drew Hedman went 3 for 3 with 2 runs scored and a RBI. Joantoni Garcia had 2 doubles in 3 at bats which produced a run scored and 2 RBI. Unfortunately we have some sad news to report this afternoon. Former Sox farmhand Greg Montalbano passed away on Friday after a fourteen year battle with cancer. A fifth-round pick in 1999 out of Northeastern, Montalbano played in the Sox system until 2004, and during that time was named the Red Sox minor league pitcher of the year in 2001. Our prayers and condolences go out to the Montalbano family. In the aftermath of last night's defeat by the Yankees, the Red Sox have optioned Michael Bowden back to Pawtucket and recalled Enrique Gonzalez to take his place in the bullpen. Gonzalez last pitched for the big club in their disastrous four game series at New York, allowing 2 earned runs on 3 hits, two of which were home runs, in 1.2 innings of work August 8. On the season with Pawtucket, Gonzalez owns a 7-11 record, allowing 74 earned runs on 149 hits over 127.1 innings pitched in 23 games (21 starts) for a 5.23 ERA and held opposing batters to a .290 batting average. In his last outing with the Paw Sox he allowed 1 earned run on three hits and two walks in 3.2 innings of work against Rochester (Twins) August 18. 8/22 Cup of Coffee: Tim Wakefield gave up a run on 2 hits and threw 81 pitches over 5.2 innings to help Pawtucket break their 10 game losing streak and score a 2-1 victory over Rochester. Jose Vaquedano, Dustin Richardson, and Javier Lopez each threw 0.2 of an inning without allowing a run. TJ Large pitched the final 1.1 innings retiring all 4 batters he faced to earn his first save in AAA. The game turned in the bottom of the 5th when the PawSox scored 2 runs to overcome a 1-0 deficit on RBIs by Josh Reddick and Jeff Bailey who were each 1 for 4 in the game. Potomac scored early and often on way to a 11-0 hammering of Salem. Stephen Fife did not retire a batter in the 2nd inning and was charged with giving up 7 runs on 7 hits. He had a pair of strikeouts. Armando Zerpa did not fare much better going 1.2 frames. He allowed 4 runs on 4 hits and 3 walks. Josh Papelbon pitched 4.1 scoreless innings allowing 4 hits. He had a strikeout. Derrick Loop continued his excellent work by throwing another clean inning. He has not allowed a run in his last 5 appearances and over his last 10 games his ERA is 0.75. The Salem offense managed just 4 hits in the game. Lowell scored 8 runs in the bootom of the 6th inning to overcome a 1 run deficit and then cruised to a 16-7 win over Auburn. Yeiper Castillo got the Spinners off to a shaky start by allowing 7 runs on 7 hits and a pair of walks in 1.2 innings of work. Jeremiah Bayer threw 3.1 scoreless frames allowing just 1 hit. He fanned 2. Michael Bugary got the win going 2.1 scoreless innings allowing a hit and 3 walks. He struck out 3. Dennis Neuman got the final 5 outs in the game allowing 1 baserunner on a walk. He had 2 strikeouts. Wilfred Pichardo led the way offensively going 3 for 4 with 2 doubles. He scored 3 times and drove in 3 others. Ronald Bermudez went 3 for 5 with a run scored and 2 RBI. Thomas DiBenedetto went 2 for 4 and scored a run. Ryan Westmoreland went 1 for 4 hitting his 7th home run. He scored 3 times in the game and had 2 RBI. In the Gulf Coast League, the Red Sox were leading 5-0 in the 4th inning when the game was suspended due to rain. Bad weather also caused the cancellation of the Portland/Harrisburg and the Greenville/ West Virginia games. In the Dominican, the Red Sox edged the Mets 7-6 scoring the winning run in the bottom of the 10th after Lewis Urena led off the inning with a triple. He went 3 for 5 in the game. Wilfi Santana was credited with the win after pitching the final 4 innings of the game. He allowed 1 run on 1 hit and 2 walks. He had a strikeout. The Dominican Red Sox finished their schedule with a 44-25 record which left them in 3rd place 7 games behind the Giants. In a move to bolster the bullpen going into the weekend series against New York, the Red Sox have recalled Michael Bowden from Pawtucket and designated Fernando Cabrera for assignment to clear a roster spot. Bowden worked two perfect innings in relief, striking out two, against the Yankees April 26 in his only appearance with the big club in 2009. On the season with Pawtucket he owns a 4-6 record in 22 starts, all with Pawtucket, allowing 41 earned runs on 94 hits over 115.1 innings for a 3.20 ERA and .223 average. In his last outing with Pawtucket, Bowden worked 6.2 innings, allowing 2 runs on 5 hits, striking out 4, walking 2 and taking the loss at Gwinnett (Braves), August 16. He is currently the fourth ranked prospect in the organization by SoxProspects.com ... In other roster moves this afternoon, the Red Sox have activated Rocco Baldelli from the disabled list and optioned Brian Anderson to Pawtucket in a concurrent move. 8/21 Cup of Coffee: Pawtucket's losing streak reached double digits on Thursday as they fell 5-3 to Rochester despite Randor Bierd's strong start. He went 7 innings allowing 1 run on 4 hits. He did not walk a batter while striking out 8. Marcus McBeth tossed an inning giving up 4 runs on 2 hits and 2 walks. He fanned 2. Javier Lopez threw a scoreless inning giving up 2 hits. Aaron Bates went 3 for 4 with a run scored and a RBI. Dusty Brown went 2 for 4 with a run scored and a RBI. Reading blanked Portland 6-0. Felix Doubront went 4.2 innings giving up 3 runs on 5 hits and 3 walks. He struck out 3. Ryne Miller pitched 2.2 frames giving up 3 runs on 3 hits and a walk. He struck out 3. Andrew Dobies threw 1.2 scoreless innings allowing 1 hit. He had 3 strikeouts. Daniel Nava went 2 for 4. Lynchburg edged Salem 4-3. Eammon Portice threw 3.1 innings giving up 4 runs on 2 hits and 4 walks. He had 3 strikeouts. Kyle Fernandes tossed 2.2 scoreless frames giving up 2 hits and 2 walks. He had 4 strikeouts. Robert Coello pitched 3 scoreless innings giving up a hit. He struck out 4. Brad Correll went 2 for 4 with a home run. In the completion of Wednesday's suspended game, Hickory downed Greenville 9-8. Michael Lee went 2.1 scoreless innings allowing a hit and a walk. He had 3 strikeouts. Jeremy Kehrt threw 5.1 frames giving up 5 runs on 6 hits and 2 walks. He had 4 strikeouts. Jason Blackey went 0.1 of an inning allowing 2 runs on a hit and a walk. William Latimer did not record an out but gave up 2 runs on a hit and a walk. Mitch Dening went 2 for 4 with a run scored and a RBI. Oscar Tejeda went 2 for 4 with a run scored and 2 RBI. In the night's regularly scheduled game, Greenville defeated Hickory 5-1. Fabian Williamson threw 6 innings allowing 1 run on 3 hits. He struck out 5. Lance McClain threw a scoreless inning giving up a hit. He fanned 2. Ryan Dent went 2 for 3 with a home run and 2 RBI. Michael Thomas went 2 for 3 with a run scored. Lowell downed Auburn 8-6. Ryan Pressly tossed 6 innings giving up 2 runs on 4 hits and a walk. He struck out 8. Cesare Cabral threw 3 innings giving up 4 runs on 6 hits and 2 walks. He had 4 strikeouts. Ryan Westmoreland went 2 for 4 with a run scored and a RBI. Chris McGuiness went 3 for 3 and scored 2 runs. William Holmes went 2 for 5 with a RBI. Dan Butler went 2 for 4 with a run scored and 2 RBI. In the Gulf Coast League, the Red Sox downed the Twins 5-2. Randy Consuegra went 4 innings giving up 2 runs on 4 hits. He struck out 6. Richard Wasielewski threw an inning and did not allow a run. He gave up a hit and had a strikeout. Hunter Cervenka tossed 2 scoreless, hitless innings giving up a walk. He fanned 2. Michael Lennox threw 2 clean innings recording 2 strikeouts. Jose Garcia went 2 for 3 with a run scored and a RBI. Player of the Night: Fabian Williamson who allowed 1 run on 3 hits over 6 innings. He did not give up a walk while striking out 5.